Professional stand-up Dobie Maxwell has beaten out nine other contestants to earn the title of "Zaniest Person in Chicago." Local comedy club Zanies sponsored the tourney as part of its 30th anniversary celebration. Finals were held on November 30. Besides bragging rights, Maxwell gets a free trip to Hollywood and tickets to The Tonight Show. The ten finalists got there by winning one of the club's monthly competitions. 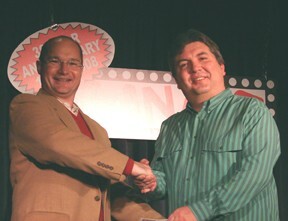 Andy Woodhull and Michael Palascak (my pick for Best Stand-Up in the Reader's 2008 Best Of Chicago issue) were named runners-up. A panel of five judges rated the comics on "showmanship, stage presence, originality of material, content, and of course funniness." A closer look at Hot Chocolate's burger, ranked second in the city by Chicago magazine.